Hull KR boss Chris Chester admitted Leigh were the better side despite his team claiming a 36-26 victory to wreck the Centurions’ two-year unbeaten home record. 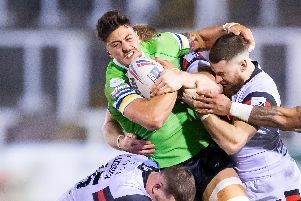 Leigh, who had already taken Super League scalps of Wakefield and Salford this season in the Challenge Cup, romped into a 24-6 interval lead with tries from Ryan Brierley, Greg McNally, Andrew Dixon and Tom Armstrong. However, Rovers, who had led through Dane Chisholm’s breakaway try, dug deep after the break to run in five tries through Kieran Dixon, Maurice Blair, Tony Puletua, Shaun Lunt and Ben Cockayne. The visitors still trailed 26-24 until the outstanding Lunt powered over from close range in the 73rd minute, but Leigh could find no late response after that as Hull KR opened the Middle 8s with victory. Chester hailed his players for a “gutsy win”, but conceded the better team lost. He said: “Leigh could have scored more tries in the first half and we had a few blokes feeling sorry for themselves. We looked very ordinary. “We’ve had a tough few weeks but there were a few choice words at half-time and I put a rocket up them and they responded. “It was a gutsy win and we showed plenty of character. “Shaun Lunt coming back on gave the boys a lift. Tony Puletua and James Greenwood were impressive for us and Ben Cockayne insisted on coming back on after suffering a bad eye gash. Chester also revealed that Albert Kelly, who sat out the game with a knee injury, was likely to miss the Challenge Cup final later this month against Leeds. Leigh coach Paul Rowley, meanwhile, was left with mixed emotions following the loss. He was pleased that his side had top-flight opposition in trouble once again, but also frustrated not to have made the most of their chance. Rowley said: “We have a habit of starting the second half slowly and we missed a massive opportunity. “We are certainly kicking ourselves but we showed we can compete. “One cup final has gone, there are six to go. “Our attitude in defending aggressively was not good enough and that gave them territory. They played some good rugby and caused us problems. “Our kicking was pretty average but one more try would have taken the game away from Hull KR.